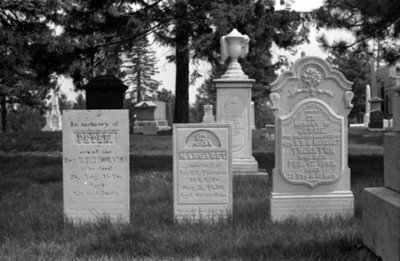 A black and white photograph of Peter, Margaret and Jessie Thornton's gravestones in Union Cemetery, Oshawa, Ontario. Robert and his wife, Margaret, had 10 children: Peter (1836-1848), Jane Todd (1837-1899), Agnes Smith (1839-1926), Robert McAlpine (1841-1913), Margaret (1843-1850), Jessie B. (1847-1869), Elizabeth (1848-1923), Margaret B. (1850-1880), Josephine M. (1852-1941) and Ebenezer James (1856-1907). MARGARET/ daughter of/ Rev. R.H. THORNTON/ DIED/ Oct. 5. 1850./ Aged 6 y'rs 11 mo./ The Lord gave and the/ Lord taketh away; blessed be the name of the Lord. Reverend Robert Hill Gravestone, Date Unknown, Brian Winter. Whitby Archives A2013_004_458C.